The adventure continues and from where I had left you at the river running through Chernobyl facing a landscape view of the Nuclear Power Station and I am now standing right outside of Reactor 4 (the one that exploded). As pictured above you can see though how badly damaged Reactor 3 also was from the explosion caused inside of Reactor 4. Also pictured is the ‘Chernobyl Monument’ which as you can see is two huge stone hands holding a nuclear reactor unit. I think the scary think about being stood right here where I am, is just how close I am stood to the point of disaster. Despite this Nuclear disaster occurring over 30 years ago, the so-called ‘Elephant’s Foot’ (a named given to the formation of nuclear fuel, melted concrete and metal) is still highly active and being exposed to it could kill you within just 300 seconds. 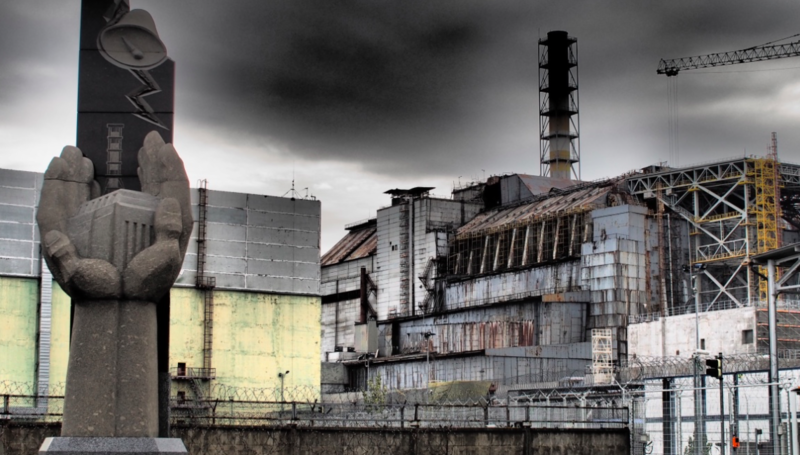 Because of how dangerous the material is, Chernobyl’s Reactor 4 has had a huge high-strength steel structure placed on top of it. Creating a sarcophagus to prevent any leak of radiation from the still burning molten material. Moving east from the structure we will now head across to one of the cooling towers. From the van we headed through a small woodland and then crossed a rail-track and then the woodland we were wandering through then opened up and right in front of me was a huge concrete built cooling tower. On the way to the structure I stumbled across plenty of damaged material which had blown from the original explosion at the Nuclear Reactor. Incredible how it had reached this far, but also showed just how powerful that explosion was. Some of the debris was plasterboard and I decided to take a reading of just how radioactive it was despite having laid here on the ground for over 30 years. I couldn’t believe the reading I received using my geiger counter. Another surprise was once I entered through underneath the cooling tower and came across some incredible graffiti! This piece of art was created by an Australian artist named Guido van Helton and was done to commemorate the 30th anniversary of the ‘Chernobyl Disaster’. Because darkness was beginning to creep in I needed to head towards the railway station of Chernobyl Nuclear Power Plant. Point C on the map shown previously above. From here tonight I would be catching the train to a town named ‘Slavutych’. A town that was purposely built to house the evacuated population of the town of ‘Pripyat’. The journey there from the station would take me through the southern foot of the nation of Belarus (showing how close Belarus also is to Chernobyl) and then back into Ukraine. At the train station I had to use a hand scanner which recorded my level of radiation and it made me feel as though I was in some kind of Sci-fi movie but then the train journey felt like I had jumped back in time. The train was full of Ukrainian soldiers all playing cards or men sat quietly reading newspapers. It was as though I’d gone through a portal at the hand scanner and was now back n the 1940s! Tonight I would certainly be needing a good sleep as next up I would be venturing into the main reason I came to this dark destination… the ghost city of Pripyat!